Apple’s iPhone XS Max is the most expensive device by Apple till now, which is launched in India a few months back. We are comparing the smartphone with Huawei’s flagship device Mate 20 Pro too see which one is the best in the premium segment? 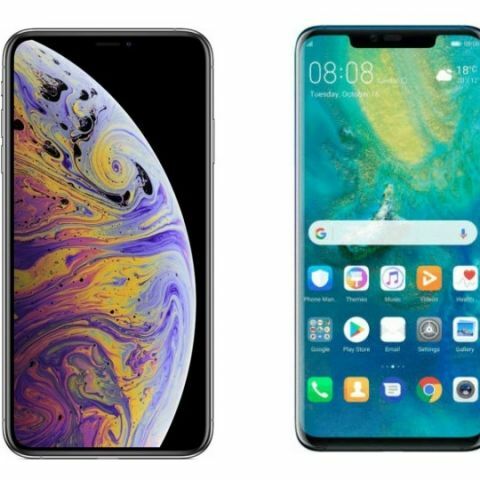 The Apple has launched three new smartphones this year - iPhone XS, iPhone XR, and iPhone XS Max among, which the iPhone XS Max is the most expensive one. The device is powered by the latest Apple A12 Bionic chipset. On the other hand, we have the Huawei Mate 20 Pro, which is recently launched in India last month with a triple camera set up at the back. Let’s do a quick specs comparison to know which device is more powerful when it comes to hardware. Let’s begin with comparing the display of these two phones in detail. The Huawei Mate 20 Pro is quite big as it sports a 6.39-inch display that offers a resolution of 1440 x 3120 pixels. When it comes to iPhone XS Max, it is the first smartphone by Apple that features a huge 6.5-inch display, which offers a resolution of 1242 x 2688 pixels. So, if you’re looking for a phone with a bigger screen then Apple iPhone XS Max sports a slightly bigger display in compared to Mate 20 Pro. However, the difference is not that big but still quite noticeable. When it comes to the performance, the Huawei Mate 20 Pro is powered by the company’s own Kirin 980 octa-core processor, which is clocked at 2.36GHz. The device packs 6GB RAM and 128GB internal memory, which is expandable to up to 256GB via a microSD card. On the other hand, the Apple iPhone XS Max is powered by the latest A12 Bionic chipset, which is coupled with 4GB RAM and 64GB internal memory. The device is also available in 256GB and 512GB storage models. As far as the cameras are concerned, the Huawei Mate 20 Pro has a triple camera set up at the back, which is also the main highlight of this smartphone. It has 40MP + 20MP + 8MP rear cameras along with a 24MP front-facing camera. On the other hand, the Apple iPhone XS Max features the same 12MP dual sensors at the back with a 7MP sensor on the front. 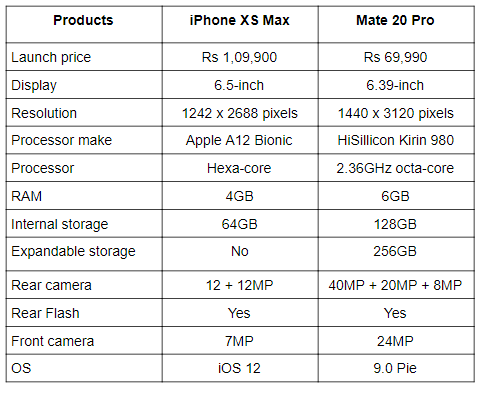 The Apple iPhone XS Max is almost Rs 40,000 (appx) more expensive than the Huawei Mate 20 Pro. The phone is available in India for Rs 1,04,900, while you can get the Huawei Mate 20 Pro for Rs 69,990 in India.